Airtight Solutions boast over 15 years of experience in the air pollution control industry and a strong background in engineering. This depth of experience allows the Airtight team to promptly identify issues and determine the best solution for your needs. This begins with an onsite consultation in which our team asses your business, discuss your business requirements and determine how best to achieve your goals. We can also provide a full examination of your existing equipment with a particular focus on airflow performance and pressure testing. This initial consultancy will then guide our design process, in which we develop a design that best fits your requirements. All our designs are created with the intention of minimising power usage while providing a solution that exactly targets your needs. 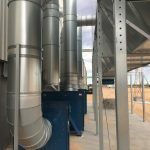 Our in-depth knowledge of engineering allows us to understand the technical elements involved in air pollution control systems, meaning an Airtight Solutions system is sure to have the correct filtration method and fan sizing to provide effortless extraction. Airtight is committed to local production, using New Zealand and Australian-made fabricated items with equipment made in Germany, Sweden, Denmark and Thailand. This ensures we can offer a wide range of products and provide the exact items you require, instead of only offering you a limited range of options for your problem. We have extensive supplies of our ducting systems, fans and dust collectors in Auckland, Christchurch, Sydney, Melbourne and Brisbane. Our expertise and access to resources means we can also offer a full turnkey system. The highly experienced project managers and installers at Airtight Solutions are skilled at installing systems from small to large. We work with the intention of minimising downtime, making the shift to an Airtight solution fuss-free. We also offer full commissioning on our systems to ensure that you receive the performance you require. Airtight Solutions perform full servicing on our own equipment as well as that supplied by others. Finally, Airtight Solutions also offer advice and information regarding your air pollution control systems so that you have all the knowledge necessary to make improvements. With expert airflow and pressure testing, we are able to comment on the performance of your existing systems and determine whether any improvements need to be made. We then provide a full written report on your air pollution control system, regardless of whether it is old or new.